It was an amazing day. It was the first day of the New Year, Nissan, in the spring, the second year since the two leggeds who were called Israel had stormed from Egypt. There had been many mistakes, mis-steps and missed marks but finally all was ready. I am the Mateh, the staff of Moshe, passed down from the first earthling with two legs, Adam. I am the one legged, from the Tree of Life in the Garden of Eden. I have been witness to it all, and I share bits of my story, flashes of my wisdom and soul pictures of what I have witnessed. The Sacred Tent was to be built. Of course “Leggos” had not been invented yet, but that is what this was. It was a Holy Leggo set made of Gold and Silver and Acacia wood and wools and skins and semi precious stones. I am not often impressed with the accomplishments of the two-leggeds who roam and trample the earth but this was something. I watched as it was put together, everyone helping, everyone joyous, everyone involved. And when it was finished it looked magnificent. And it was not just the physical beauty. It was not merely the golden beauty of the Menorah and the stand for the 12 loaves of bread, the incense and sacrificial altars. It was more than the curtain hung on the poles covered in gold and the mysterious tent within the walls. It was energy, a strange vibration that seemed to reverberate within and without. There was an amazing power that emanated from the Mishkan and everyone felt it. Imagine throwing the switch on a huge generator and capacitor, feeling the flow of energy back and forth. Yes, I say, back and forth, for a powerful emanation flowed from the Sacred Tent, through the Sacred Tent and into the Sacred Tent. It was indescribable. Even the names by which the two-legged referred to the tent struck me. Ohel Moed, the tent of meeting. I love mysterious meanings. The mystery is; with whom is the meeting. On the one hand the two-leggeds were meeting with each other in an air of high festivity. Some are getting very festive, I see. But mostly there is a sense of waiting for The One who is always there and yet sometimes hidden. Indeed that is the other name of this amazing tent. It is Mishkan, the place of Shechinah. The G who dwells in all, the Source of all Being and Blessing has named this tent, ‘The Dwelling.’ Does G dwell there or is this a place that exudes a special potency that encourages the two-leggeds to feel a little more deeply? I, who have been around longer than any two-legged, I, who have the wisdom of the trees the one-leggeds, even I do not have an answer to this deep thought. What I do know is that when all was finished, when all the preparations were complete, a cloud began to cover that sacred tent. The intensity of G’s presence became so potent that not even Moshe could not enter. 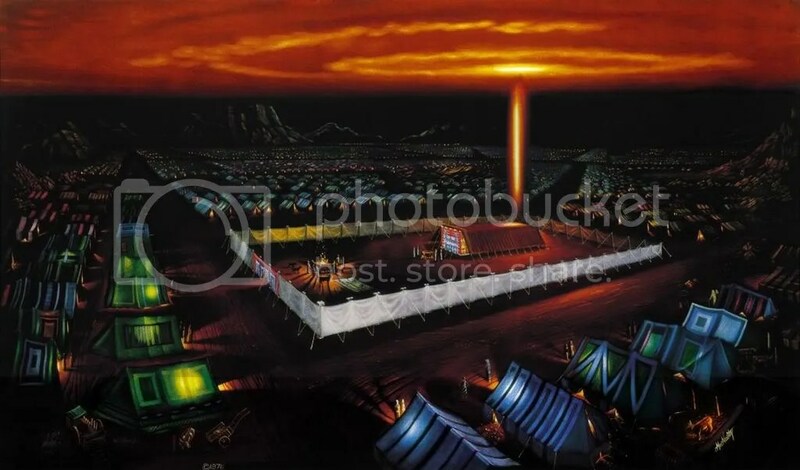 From that moment on, whenever that cloud would cover the sacred tent, the people Israel would not travel and when the cloud lifted, they would. In later times Moshe would enter the tent and of course take me. But no one else would enter at those times. In the midst of these two leggeds the ones who had crossed over the Sea of Reeds and would, in time, cross over the Jordan River, rested that sacred leggo set, the generator, capacitor, receiver of divine spiritual power. They would carry it for the rest of the time that they were in the desert and they would bring it with them into the land of promise. And some would carry it in their hearts for ever. While Jews are Jewing, what is G doing. While Jews are Jewing G is G-ding. G gave instructions for us to build outward manifestations of our relationship with G, the Tent of Sacred Meeting and then the House of Holiness, the Temple. G also taught Moshe the powerful lessons of the relationship between G-ding and Jewing. Most translators/interpreters talk of the story of Moshe wanting to see G’s face. Oh you two leggeds and how you try to make G over in your image. G has no face no physical form, to think so is purer Nefesh Behamyah, ego. I know this for I am the sacred Mateh, the staff made from the Tree of LIfe and I was there, Moshe was leaning on me as he spoke with G and I was there when he made his shocking request. The story is in Ki Tisa, the part that goes from Exodus 34:18 through verse 23. יח וַיֹּאמַר: הַרְאֵנִי נָא, אֶת-כְּבֹדֶךָ. יט וַיֹּאמֶר, אֲנִי אַעֲבִיר כָּל-טוּבִי עַל-פָּנֶיךָ, וְקָרָאתִי בְשֵׁם יְהוָה, לְפָנֶיךָ; וְחַנֹּתִי אֶת-אֲשֶׁר אָחֹן, וְרִחַמְתִּי אֶת-אֲשֶׁר אֲרַחֵם. כ וַיֹּאמֶר, לֹא תוּכַל לִרְאֹת אֶת-פָּנָי: כִּי לֹא-יִרְאַנִי הָאָדָם, וָחָי. כא וַיֹּאמֶר יְהוָה, הִנֵּה מָקוֹם אִתִּי; וְנִצַּבְתָּ, עַל-הַצּוּר. 21 And the LORD said: ‘Behold, there is a place by Me, and thou shalt stand upon the rock. כב וְהָיָה בַּעֲבֹר כְּבֹדִי, וְשַׂמְתִּיךָ בְּנִקְרַת הַצּוּר; וְשַׂכֹּתִי כַפִּי עָלֶיךָ, עַד-עָבְרִי. 22 And it shall come to pass, while My glory passeth by, that I will put thee in a cleft of the rock, and will cover thee with My hand until I have passed by. כג וַהֲסִרֹתִי, אֶת-כַּפִּי, וְרָאִיתָ, אֶת-אֲחֹרָי; וּפָנַי, לֹא יֵרָאוּ. Here is my explanation of what occurred, and remember, I was there. Moshe asked to ‘see’ that is understand the weighty presence of G. Moshe was asking to ‘see’ into the depths of G.
How did G respond to this request? G granted Moshe’s request and also denied it. G told Moshe that 2 things would happen. All the goodness that flows from G would be ‘seen’ in Moshe’s heart/mind and Moshe would ‘hear’ in his soul the very Name of G. When we know someone’s private personal name, we know something of the depth of that person. How much the more so when we speak of G. And since G’s name implies not just eternity, but the emanation of G into eternity, this is not small knowledge. But G also was clear that a soul that is wrapped in the limitations of a body cannot not truly understand the ‘essence’ of G. The Hebrew word is פני and many have translated it as “G’s face”. How silly of them. The word has so many meanings. In this case a better, deeper meaning is G’s innermost essence, that which is hidden from the bodily senses. It can even mean the emptiness that is the core of oneness. “Face” allows us to peer into the manifestations. “The innermost emptiness” opens the door to the mystery. Then G showed Moshe an opening in the rocks, a place chiseled out for him to be cushioned safely from the shock blast of what would occur. I could barely fit in with Moshe, but we squeezed into that ‘cleft’. G added a filter through which Moshe could sense all that G caused to pass through him. As I was there with him, I felt what Moshe felt and I have to say it was the most intense awareness that has ever come over me. I could not begin to put it into words. It seemed as if all time and space and all that was good in potential was passing through us. And then the filter was lifted and we saw the spirit path of the two leggeds and how there was an interface between all that has happened in the universe and more particularly on this planet. It was so clear that if you two-leggeds would flow in harmony with the life force that exists in all things, animals, humans, trees and vegetation, the 4 (or more) leggeds, the 2 leggeds and the 1 leggeds (like the Tree of Life of which I am a part), you 2 leggeds would bring about a heaven on earth. This whole planet would be a Garden of Eden. After that experience, as is hinted in Torah in chapter 34: 33-35, Moshe was filled with a deeper awe and awareness. One could see it in his eyes, feel it in his presence. It was so powerful that he had to veil his depth before the people. No he did not wear a real veil. But he did veil his inner self, for it was too intense for most people to handle. Only when he would be alone with G, and of course me, did he unveil himself in prayer and meditation. And to this day, all the 2 leggeds who follow the Torah path of prayer and study and meditation, the Mitzvah path, can have a ‘taste’ of what Moshe experienced.